1 OWNER -- NAVI & DUAL SUNROOFS -- FRONT & REAR HEATED SEATS -- CLEAN CARFAX! 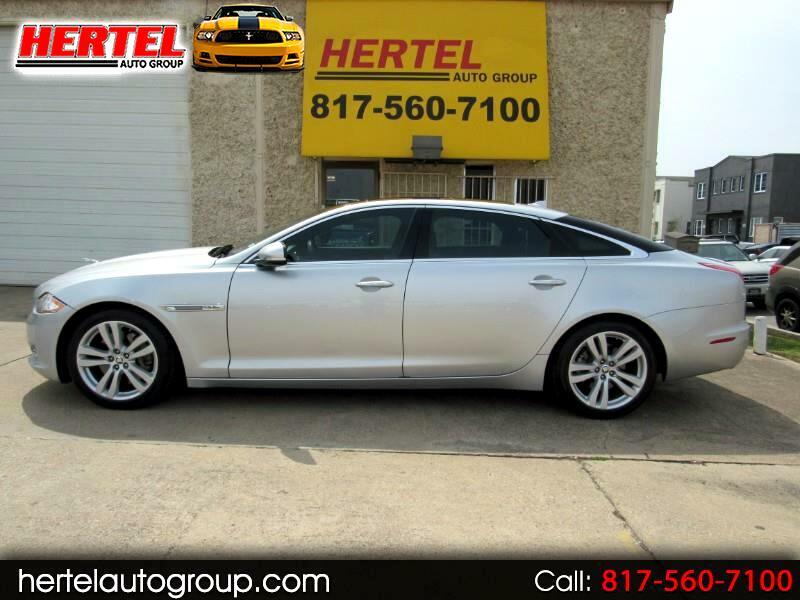 Hertel Auto Group is pleased to offer this ultimately-upscale; powerful-performing; incredibly-equpped, unparalleled-riding 2013 Jaguar XJ L Portfolio V8 Luxury Sedan for sale in Fort Worth Texas. Just acquired from the executive of a well-known Fort Worth company, this world-class sedan was impeccably maintained and cared for during its 5+ years of local ownership. If it "hiccuped", they took it to the Jag Doctor. That's the kind of attention that went into this plush and posh XJ L. Imagine waking into a luxurious and well-appointed Jaguar Dealership in 2013 and coming across this car. Of course you'd be wowed by its beauty and elegance, but you might have also done a double-take at its original MSRP of $81,200 + options and destination. Saving $56K on one of the world's best cars that's priced like a Honda Accord?!? That's a bargain in anyone's book. Designed to compete with world-class cars like the Audi A8, BMW 7 Series and Mercedes-Benz S-Class, the Jaguar XJ L sets itself apart with stunning, unique and retro-cool styling. Further setting itself apart is its aluminum construction. The weight of an aluminum body panel or suspension component is about one-third that of its steel equivalent, which helps explain why it usually weighs in at about 400-600 pounds lighter than comparable competitors - translating to better fuel economy and a better power ratio. For the 2013 model year, the XJ R benefited from an improved electronics interface and a new sound system. On the road, this better-than-butter Jaguar slides down the road with the stealth of 385 Horsepower and 380 lb ft under its hood. Looking for an instant smile on your face? Stomp (or perhaps in a Jaguar, it's more correct to say "Apply Pronounced Pressure") on the gas pedal and watch 0-60 whisk buy in the mid-5-second range. Mechanically, it drives, shifts and performs exactly like you'd expect it to. There are no "Check Engine", "ABS" or "Air Bag" lights present and it has a fresh inspection. On the outside, this exquisite Jag sports a sleek Rhodium Silver Metallic Paint Scheme that is complimented by a Black Leather interior. Inside, the smoke-free interior of this Jag poses the question, "What *doesn't" it have on it?" Aside from its "L" designation which adds a Cavernous Rear Seat; Rear Vanity Mirrors & Manual Rear Sunshades that position it as being unrivaled in the industry; its upgraded Portfolio Edition adds Heated and Ventilated 16-way Power Front Seats with a Massaging Function; Dual-Zone Automatic Climate Control for Rear Passengers; and Heated and Ventilated Rear Seats. heated and ventilated rear seats. You'll also enjoy a host of other amenities that include Navigation; 14-Speaker Meridian Sound System; Dual Power Sunroofs; and just about every other option you could imagine. As with any pre-owned vehicle, it does have the usual amount of cosmetic imperfections that are inherent to a vehicle of this age and mileage. We invite you to view all of the photos that are available on our Web Site and determine for yourself if it meets your expectations for a vehicle of this age and price. If it does, we then welcome you to stop by for a viewing and test-drive of this incredibly luxurious 2013 Jaguar XJ L Portfolio Luxury Sedan. Given its scarcity in the marketplace; mileage; condition; ownership history and options, we've priced it competitively in the marketplace and expect it to sell quickly. Don't let this wordl-class car with a great warranty pass you by!